We briefly visited Austria in 2015 when we stopped for one night in Innsbruck. We absolutely loved it and had it in our minds that Vienna would be a similar city. Vienna is, in fact, nothing like Innsbruck. They are vastly different in atmosphere and size. Vienna is Austria's capitol. It is made up of several palaces, tall buildings, a full metro system and lots of people. While it still has some Austrian charm, we must admit that Vienna has been the least child friendly city we have visited. Even so, our Airbnb was one of the best we have ever stayed in and we made the best of this unique city. We spent 3 days and 3 nights in Vienna (including a day trip to Bratislava, Slovakia). 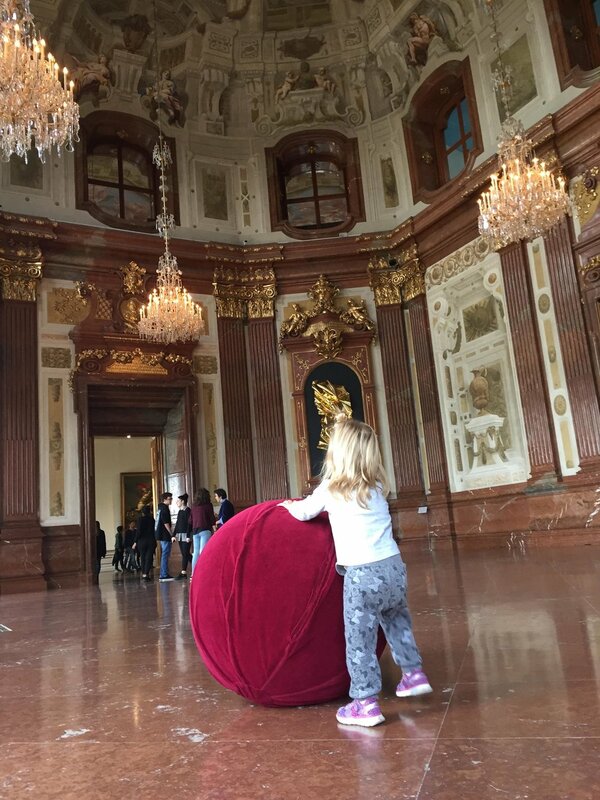 We want to share our 6 favorite spots in Vienna to visit with kids. 1.) An Old-Town Ringstrasse Tram tour: The Vienna Ring is an Austrian World Heritage Site. The majestic boulevard was laid out in the mid-19th century around the centre of the city, replacing the old city wall and the glacis. The public Tram takes you in a full circle around Old Town Vienna. It is very cheap, but helps you get your bearings and you'll get to see so much of the city as you pass by. We followed Rick Steve's narration as we rode the tram, so we knew what we were looking at. The tram has a dedicated stroller area, so our double stroller fit very nicely. Cost: Single ride tickets are 2.20€ and you’ll have to use one every time you get on. Another option is to take the Tourist Vienna Ring Tram (Yellow Tram) - this tram makes the entire loop (can't hop on, hop off) but they narrate the entire trip and have TVs to help explain what you see. Find more info HERE. 2.) St Stephen's Cathedral: You can't go to Vienna and NOT see this cathedral. The church has an iconic Gothic style tower that was built to "Praise God from the Center of the City." Everything in Ringstrasse circles around this grand cathedral. The day we visited it was cold and raining outside, so this made for a perfect stop. Once inside the cathedral, we chose to pay to walk the main nave. (only 4 Euro) We had our double stroller with us and only encountered any tight spaces when in line to pay. Other than that, the space is large and a stroller is easily maneuverable. 3) Upper Belvedere Palace & grounds: Our incredible Airbnb was located very close to this Palace. (Technically its TWO Palaces; Upper and Lower) We toured it the second day and I have nothing but good things to say. The grounds are fabulous with intricate and vast gardens; making for some amazing photos. Inside the Palace is an expansive art gallery that is home to many original Gustav Klimt paintings. Inside you will also find a small cafe and museum store. For us, the most enjoyable part was the The Marble Hall where they had giant soft balls to roll around. Our toddler ran around that room and kicked/pushed the balls everywhere. 4) Hofburg Palace Grounds ONLY: We roamed the grounds of this Palace for a couple hours. There is a convenient kids park (with gate), many photo op spots and what seemed like an endless walking trail leading from lush gardens to commanding palace courtyards. We had a great time just meandering around and taking in the good weather. However, we do not recommend the internal tour to families. This was the very first time in Europe that we were told we could not bring a stroller or diaper bag into an attraction. Also, they would not allow us to store our diaper bag or stroller anywhere. This left us with one option: to leave. I am sure the inside is magnificent and maybe one day when my kids are grown we can go back and all tour together, but this visit, we left a little defeated. 5) Cafe Sacher: The website for Cafe Sacher says it best "The quintessential Austrian café in the heart of Vienna: A must for every visitor. Café Sacher Vienna offers the perfect chance to sample a typical Viennese coffee-house atmosphere and – of course – to treat yourself to an Original Sacher-Torte." OH MAN we absolutely LOVED every single dessert we tried. When we first walked into the Cafe we almost didn't go inside because it was small and looked very swanky. We, of course, had our giant stroller and thought the kids might put out other guests, but the host welcomed us in. We were able to leave our stroller in the main hallway and carry the kids to our back corner table. The story behind this controversial dessert is almost as as intriguing as the cafe's I highly recommend this fun stop for some decadent Sacher-Torte. 6) Naschmarkt: The Naschmarkt was an absolute welcomed surprise. Had we not been following Rick Steve's walking tour, we wouldn't have know to look for this Vienna gem. The Markt is a gigantic street market packed with vendors, restaurants, bars and shops. Interestingly, a market has been in this location since at least 1780s when it was a dairy farmer's market for the trading of milk and other dairy products. Over time, it has grown to over a kilometer long, over 100 stalls and gone from purely produce to an international mixture. Admittedly our stroller was a bit of a bear to get through the tight allyways, but if you were babywearing or had a small singler stroller, you would be fine. Hofer: OK OK, we didn't actually EAT in the grocery store, but this is how we prepared all of our breakfasts and most of our dinners. We saved a lot of money this way. Edelgreisslerei Opocensky: This little grocery store/cafe had the most amazing waitstaff and even more amazing food. (Try the Artichoke Heart YUM!) Jimmy and I had dinner and wine here and the chef (American born) came out and spoke to us for a long time. We absolutely loved the "local" atmosphere and, obviously, the divine food. This metro has to be one of the easiest to navigate. There was a stop near our apartment. They have escalators (and many have elevators) to get the stroller down into and up from the stations. We used the metro system every single time we went downtown and back to the apartment. Children: Children up to the age of six travel free of charge on the Vienna public transport network. Children up to the age of 15 travel free on Sundays and public holidays and during the school holidays in Vienna (this includes the week before Easter, July 6th through August 31st, and Dec 23rd through Jan 6th). An ID card may be helpful to prove a child's age. Our final day in Vienna was spent doing a day trip to Bratislava, Solvakia (blog post coming soon). If you have the time, I absolutely INSIST you take the short train ride over and visit Vienna's sister city and the Capitol of Slovakia. Have you been to Vienna? Let us know what you thought of your visit!